Perry Cox - One of the Absolute Top Leading Authorities on Beatles Records & Memorabilia and Author of "The Official Price Guide To The Beatles Records And Memorabilia". See our latest ad in the Perry Cox's Beatle Price Guide. 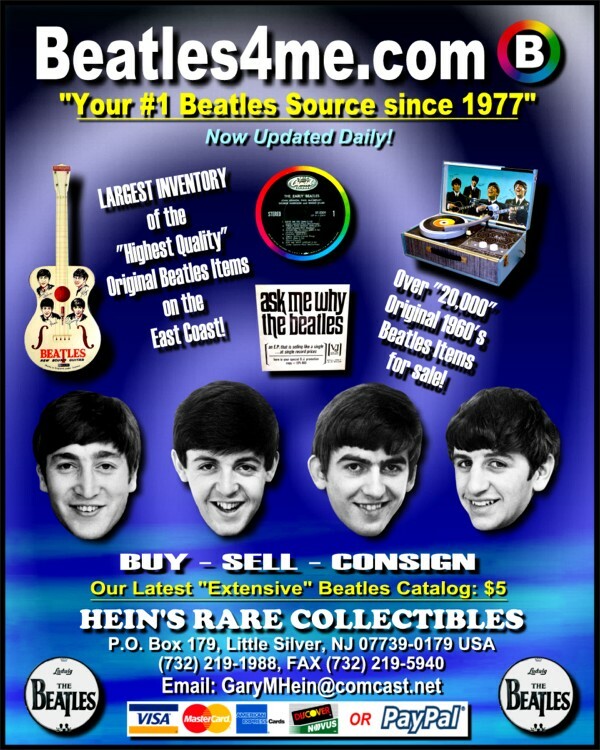 The new Perry Cox's Beatle Records & Memorabilia Price Guide is now available! We have been working closely with both Perry Cox and Bruce Spizer to help bring you more comprehensive Beatle Books covering all known "variations" of each Beatle Record released here in America. Dozens of images of Beatle Records from our vast archives have been used for these Beatle Reference Books. Many of the "new discoveries" that will be documented in the new Perry Cox's Beatle Price Guide are now available on our Beatle website at www.Beatles4me.com. We Buy & Sell Original Beatle Autographs, Beatle Records and Beatle Memorabilia and Beatle Collectibles. Feel free to drop us a line regarding the current status of Perry's latest Beatles Price Guide. Also remember, some of the "New Discoveries" to be introduced in Perry Cox's Beatles Price Guide are now available at www.Beatles4me.com. As time permits, we update our website with new Beatles Inventory as it is received. Don't forget, we Buy & Sell Original Beatles Records, Beatles Memorabilia and Beatles Autographs. Click the link above and come see our "Extensive" Beatles Website, where we list our Beatles Records, Memorabilia and Autographs!! !